It’s time to pay X-Bet a visit, because this fantastic eSports bookie is running a killer promotion that you don’t want to miss out on. You’ll receive 500 credits in play money and if you manage to turn these into 10000 within the promotion period (26th – 27th of January) you’ll be rewarded with €100. Get lucky or use your betting skills – either way it may be the easiest earned cash ever and you don’t have to risk any money yourself! How do I take part in the promotion? 1. Have a registered account with X-Bet with at least one deposit on it. If you don’t have one, you can quickly create one by signing up here. When depositing, use bonus code EBF50 and your first bet will be fully returned to you if lost (up to €50). This way you bet with no risk! Once you’ve complete these two steps, an e-mail will be sent to you the day before the promotion (on the 25th of January) giving you log in details to a separate account with 500 credits on it. Spend them wisely or take big risks with high odds, it’s all up to you. Just remember, no casino games are allowed, only betting! There’s nothing to lose, but plenty to win. Reach 10000 credits and you’ll be greatly rewarded with €100 on your real account – no strings attached. Cash them out and buy you something nice or use your betting skills to increase them even further. Pay a visit to X-Bet! 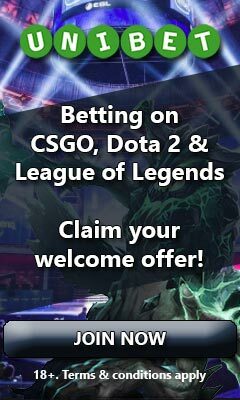 X-Bet is a high quality eSports betting site with a fantastic selection of odds on more than 20 different eSport titles. They offer plenty of matches and a lot of entertaining markets for the most popular games. Included in their highlights are also fast withdrawal and settling times; lucrative promotions; a random betting jackpot and more than 700 casino games. As a new registering player, you’re also able to take part of a very valuable welcome bonus with no risk, which is an offer exclusive to all of the users at eBetFinder. To find out more about this and the betting experience at X-Bet, head on over to our full X-Bet review.